Scream "Avalanche" as loudly as you can; or louder. In fact, anyone within earshot should yell, "Avalanche!" Yelling alerts potential rescuers who might become victims themselves, it gets more eyes on the victim, and it might summon nearby rescuers who are unaware that an avalanche is occurring. Your best chance of survival is to avoid being buried. That means doing everything you can to get off the avalanche. Initially, that may mean skiing or riding off the avalanche itself. That's a great alternative if you're near the edge of an avalanche and have momentum. If a tree or brush is nearby, try to grab onto it. If you're near the fracture line at the top of the avalanche, you may be able to scramble uphill to get off the moving snow, or scratch and claw into the bed surface so a shallow avalanche slides away from you. And don't even think of out-skiing an avalanche. They typically accelerate from 0 to 70 miles per hour in about five seconds. Depending on the size of the avalanche, you might be able to out run an avalanche if you are on a snowmobile. If you are wearing an avalanche airbag, you should deploy it as soon as practical. Don't delay inflating your airbag until you are certain you will be buried—there are numerous cases of people failing to deploy their airbags. The exception to deploying your airbag, and you will need to make this decision before you are involved in an avalanche, is based on the fact that airbags keep you on the surface and (usually) have you travel further. If there are trees, a cliff, or other hazards below you, staying on the surface and traveling further might be more dangerous. When in doubt, pull that trigger! If you can't escape the avalanche, do everything you can to survive it. That includes trying to stay nearer the surface by fighting anyway you can. You've probably heard that you should swim, but you really should do anything and everything you can to stay on top—you won't be "swimming" freestyle or breast stroke in tumbling avalanche debris! If you have an AvaLung and it isn't already in your mouth, that's obviously worth attempting. And if it is in your mouth, clench it with your teeth and pray that it remains there. You should also do whatever you can to limit the likelihood of traumatic injuries. In the event of a slow-moving sluff, that might mean getting your feet downhill. In a more typical-sized avalanche, it may mean protecting your head with your arms. I have heard the suggestion that you reach an arm across your body, grab the opposing backpack strap, and tuck your face into your elbow. That sounds like a good idea if you can accomplish it. Experts say that, as the snow slows, you should attempt to create an air pocket in front of your face and extend an arm upwards. Those are worthy endeavors in a smaller avalanche, but they might be impractical in a more violent avalanche. If you are buried, and this is likely easier-said-than-done, relax and trust your partners. Struggling and panicking will only increase your respiratory rate. What Should You Do If Your Partner Is Caught in an Avalanche? 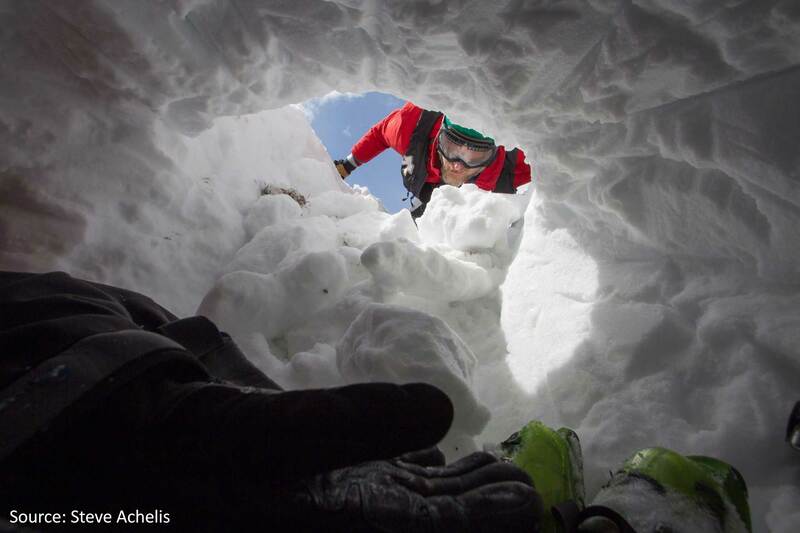 If your partner is caught in an avalanche, the first thing you should do is save yourself. Really. You'll be of no help to your buried partner if you are injured or buried. As soon as you can do so safely, watch the victim. You are trying to establish the area where they were last seen. Try to pay attention to the victim relative to landmarks so you will be able to recall the victim's location. You can dramatically reduce the size of the search area if you establish the location accurately. You can also delay the rescue if you mistakenly select a location that is too low. As mentioned above, everyone who knows that an avalanche is occurring, and anyone who hears the call "Avalanche! ", should yell, "Avalanche" loudly. The importance of leadership in high-stress situations can't be understated. During an emergency, our instinct is to charge in and help. But as we rush in with tunnel vision, it is almost a certainty that several people will perform the same task and that other important tasks will be neglected. Even in small groups, having one person focused on the big picture will improve the team's performance. One of the key roles of a leader is to see that everyone has an assignment, a job, and that the right jobs are being performed. A good leader repeatedly considers whether the team is doing the right things, whether they are being done correctly, and what needs to be done next. They will help determine the number of people who are buried or injured, whether all transceivers have been switched to search mode, and when to call for help. Although it may seem difficult to establish leadership a few minutes after an avalanche occurs, it will be harder to establish later. Reconsidering rescuer safety is an ongoing task. Snow that remains above the avalanche's crown, which is called "hang fire," is rarely a safety concern unless somebody skis onto it. I have surveyed dozens of avalanche experts and haven't heard of a case where rescuers were buried by a secondary avalanche while they were performing a companion rescue on the avalanche debris. I did hear of one rescue that was called off due to secondary avalanches, and there are several cases of avalanches burying professional rescuers later (often in the following days) as the snow continued to accumulate. It is also important to consider the risk of avalanches from converging drainages and the potentially significant risk to rescuers as they attempt to return to the frontcountry. When to call for additional help is a frequently debated topic. In Europe, where a helicopter is nearby, warmed up, and ready to go, it might be possible for rescuers to arrive in time to help extricate an avalanche victim. However, knowing that only 40% of avalanche victims survive a 15-minute burial, every minute you delay the victim's extraction while summoning help is time wasted. Number of Rescuers? If there are enough skilled rescuers (e.g., four or more? ), spending a few minutes calling for help might not adversely affect the victim's survivability. Certainly, if there are more than enough people to perform the rescue, the call should be made as soon as possible. Airway? In most cases, delaying the call for help until you have opened the patient's airway and the victim is breathing (or a rescuer is performing CPR) is the appropriate time to call for help. Keep in mind that even if you do postpone calling for help, it is extremely likely that you will need assistance providing medical care and transporting the victim. Don't delay the call excessively: call for help as soon as it won't adversely affect the victim's survival. When you are ambling along a skin track, it's wise to ask yourself, or your partners, "If an avalanche happened right now, when should we call for help?" Asking yourself this before you need to make a decision will reduce the complexity of answering it when you do. You are reporting a backcountry avalanche. You may have to say this several times as the dispatcher repeatedly prompts you for your address. You don't want police or firefighters—you want backcountry rescuers. Your location. This can get complicated. Certainly, a longitude and latitude are optimal, but that is often hard to find and communicate quickly. Some locales, like the Wasatch mountains in Utah, have a backcountry ski map that is used by backcountry skiers, 911 dispatchers, the police, and rescuers (that's my "sponsored link"). The number of people who are buried. After providing the necessary information, hang up your phone and help your partners. Knowing answers to the following questions will provide you with situational awareness that will help you perform a better rescue. If you witness an avalanche accident, or if the accident involves your own party, you will probably already know the answers to many of these questions. But don't make assumptions—just because you only saw one member of your party become engulfed by an avalanche doesn't mean there aren't more victims. If you arrive at an avalanche that didn't involve your party, you should quickly and efficiently gather this information from witnesses. How many people are buried? If the avalanche did not involve members of your party and you can't interview witnesses, you may be able to determine the number of victims using your avalanche transceiver or by observing physical clues (e.g., finding two different brands of skis). If multiple people are buried, you will have to perform a multiple burial search. Was the victim wearing an avalanche transceiver? How long has the victim been buried? Where was the victim last seen? Has anyone called for help? Looking for visual clues on the surface of the avalanche is a continuation of gathering information and is component of the search—it must not be overlooked. Visual clues might include gloves, skis, etc. If you do discover a glove, ski, or pole, check to see if it is connected to a victim. There are many examples, including avalanches that I have responded to, where gear on the snow surface was still connected to the victim. In addition to looking for clues during these first few minutes, you should be on the lookout for clues throughout the transceiver search. After finding a clue, announce it loudly so your fellow rescuers know about it ("I found a red ski pole!"). If the clue is a ski or pole, stand it up vertically so others can see it. If you find smaller clues, like a glove, and if you are carrying flags (an item often carried by professional rescuers), put a flag next to the clue. And don't stand up or leave rescuer gear on the avalanche debris that might be mistaken for a clue.